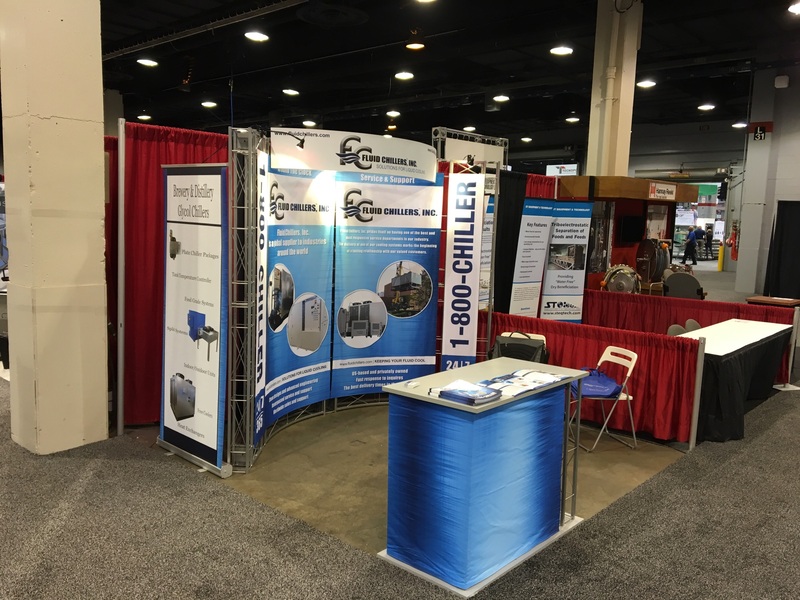 This past week Fluid Chillers attended the Process Expo in Chicago. 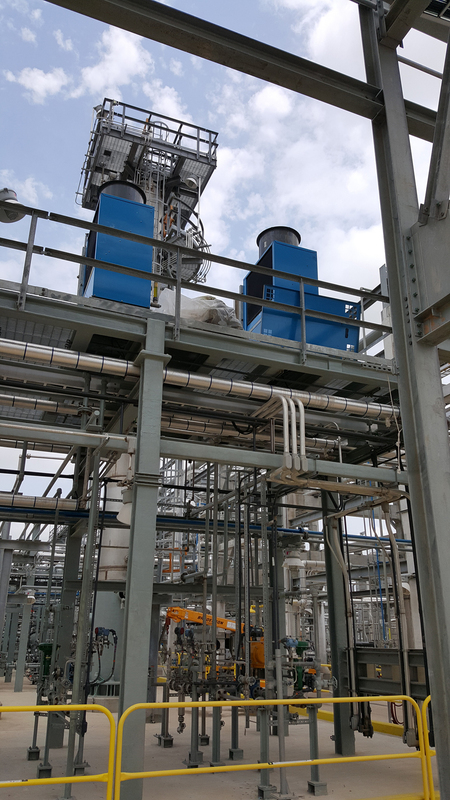 Fluid Chillers Inc. has recently designed and built a chiller system for NASA, which will keep the astronaut compartment cool prior to actual liftoff on the rocket launch pad. 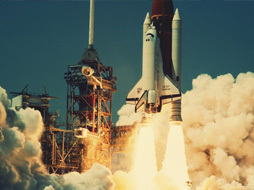 Blast plates will protect it from being disintegrated by the rocket blast during lift-off. 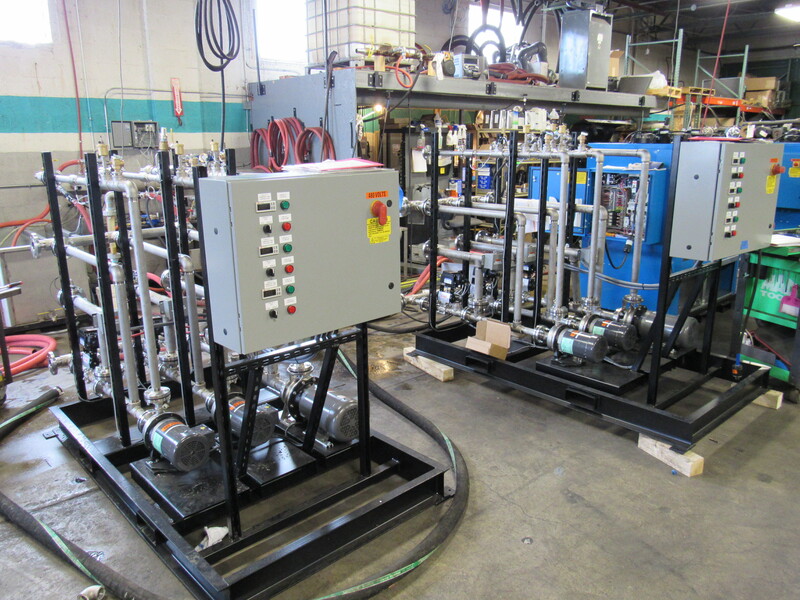 Fluid Chillers has a complete line of direct injection, multi-circuit, mold temperature control systems. There is virtually no limit to the amount of circuits one skid can accommodate. These are ideal for customers with mold related heat issues and water quality issues. 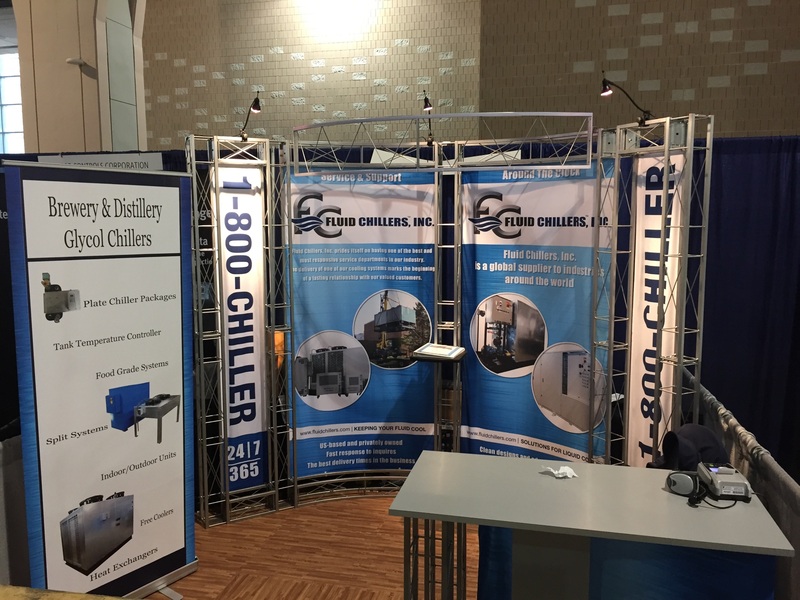 Fluid Chillers displayed at the National Craft Brewery Expo 5-2-2016 to 5-6-2016 in Philadelphia PA. This project is a highly engineered "DI" water cooling system which works with an outdoor chiller. Heat exchanger is controlled and monitored by a PLC and building management software. Integrated "DI" filters and purification system. Process tank and pump system with controls to precise temperature control and water purity. 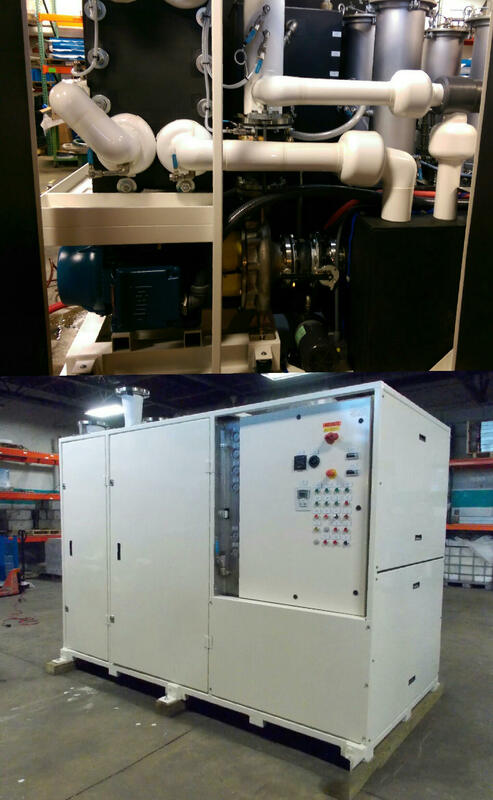 Fluid Chiller Inc. builds Division 1 Class 2 explosion proof chiller for various industries such as oil, gas, chemical, and food processing. 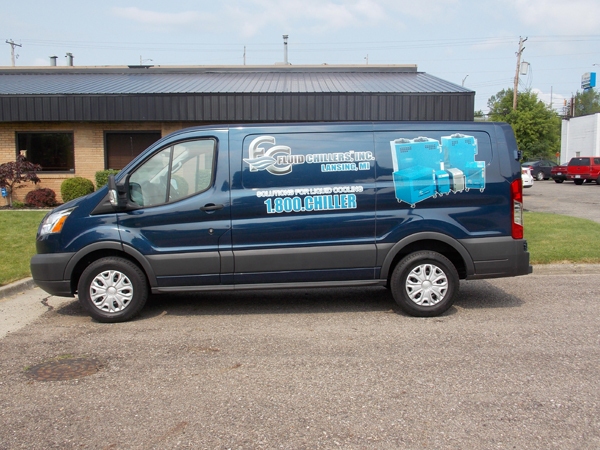 Fluid Chillers has been replacing its outside service vehicles with new, more efficient vans. Doing what it takes to increase our service to our customers and passing the cost savings along to them as well. 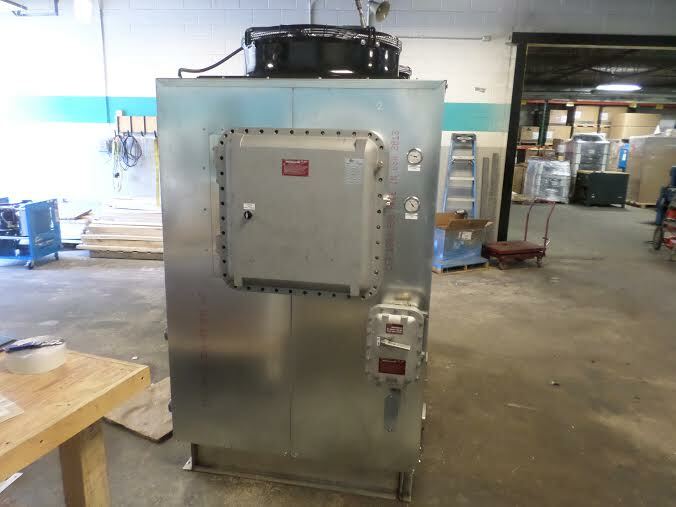 Fluid Chillers Inc is a leading supplier of low temperature chillers into the brewery and distillery markets throughout the US, Canada and globally. 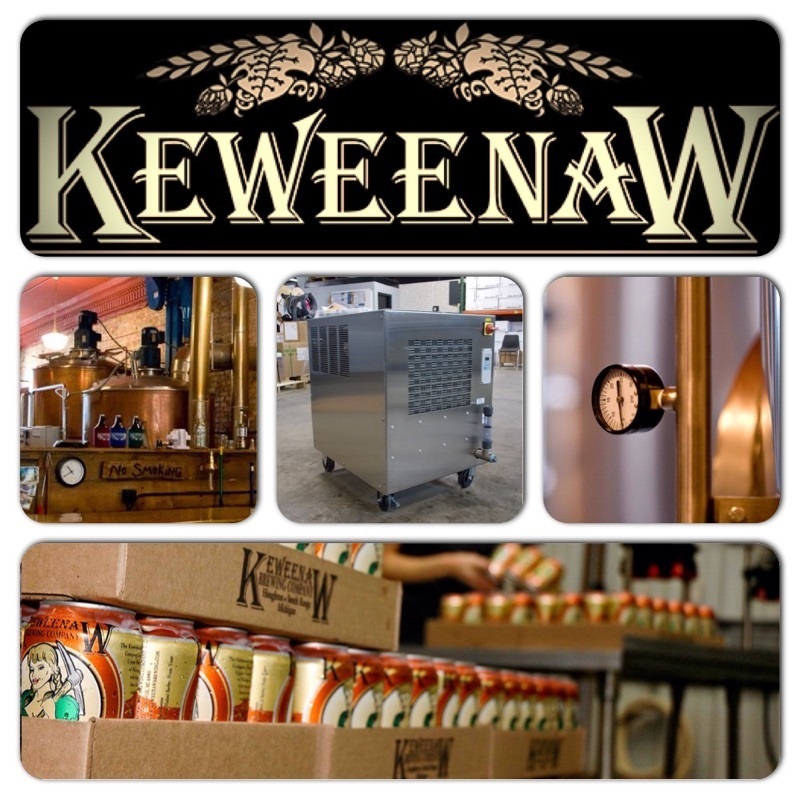 We recently completed an installation at Keweenaw Brewing Company in Houghton MI. Since several of our engineers completed their schooling in Michigan's Upper Peninsula we took special pride on this project. 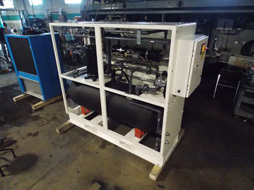 Multi-circuit chiller with "free cooling" option set up to chiller high speed press line. This is half of the system. The other half plugs into the end piping when new press arrives. "Free cooling" options chills fluid when ambient air temperature is below 40°F. This reduces consumption by 90% by utilizing ambient air rather than mechanical refrigeration modules. 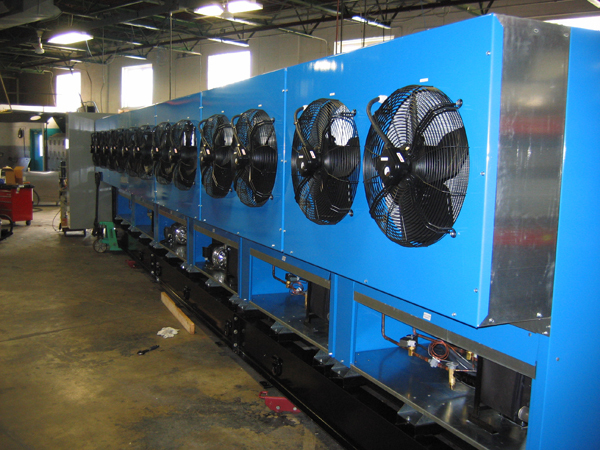 Fluid Chillers Inc. manufactures a full line of chillers built for explosion proof environments. Class 1, Division 2 & Class 1, Division 1. (These are available in all voltages and all sizes) Typical Environments are offshore oil rigs, chemical processing plants, oil refineries, etc. 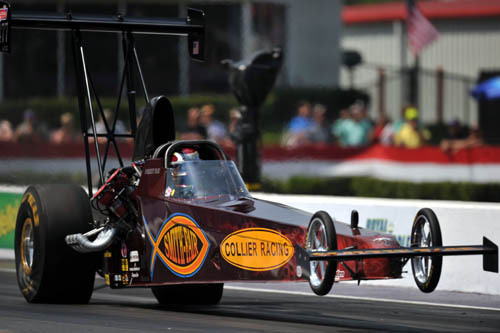 Fluid Chillers Inc. has developed a line of chillers for keeping fuel cool on high performance vehicles, drag cars, NASCAR, Airplane, and others. 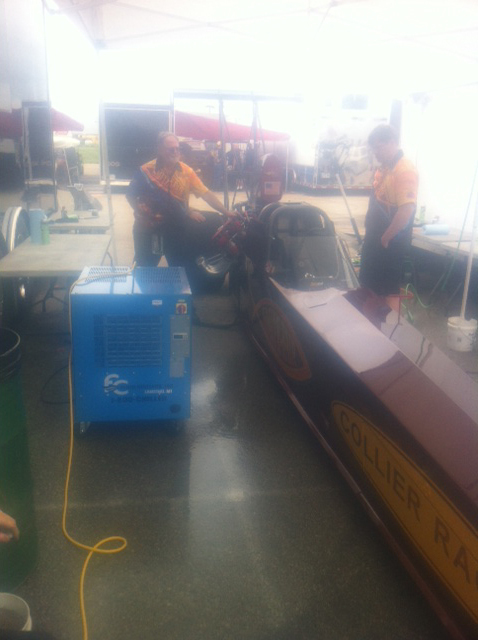 We can recirculate the vehicles tank and maintain a low fuel temp for optimal vehicle performance. 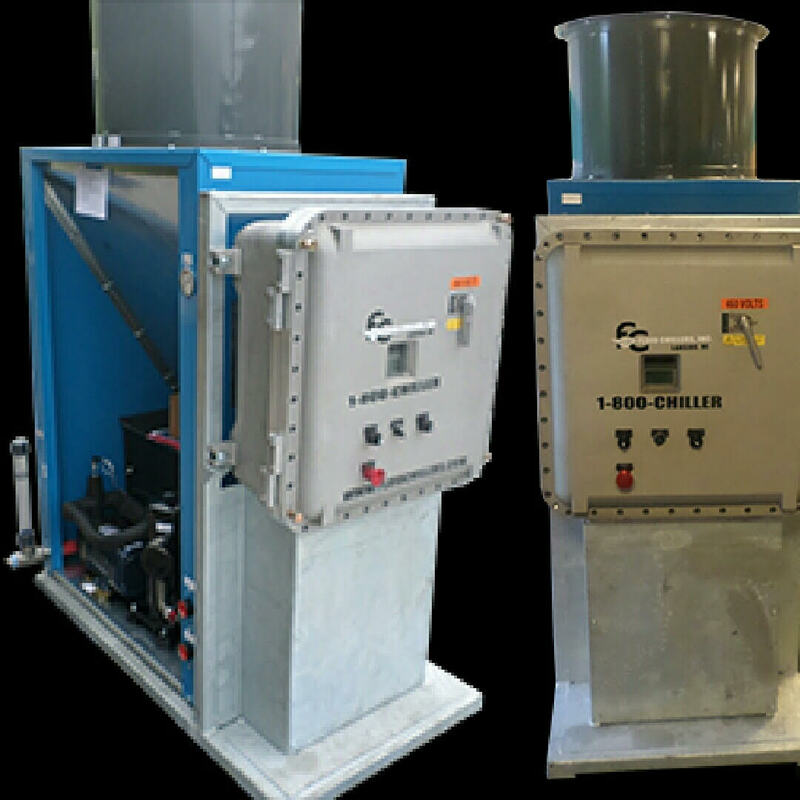 Fluid Chillers Inc. manufactures a full line of commercial drinking water chillers designed to meet customer specifications. 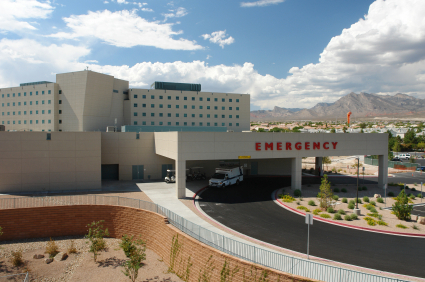 This unit services a 50 story building and is located in the basement. 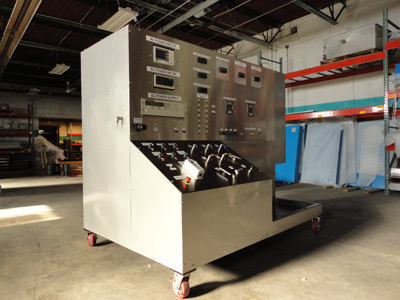 This custom test stand was constructed for a customer to test tanks, It will cool and heat fluid, and allows the customer to adjust flow rates and pressures. The PLC interfaces with all testing and records data for production runs. 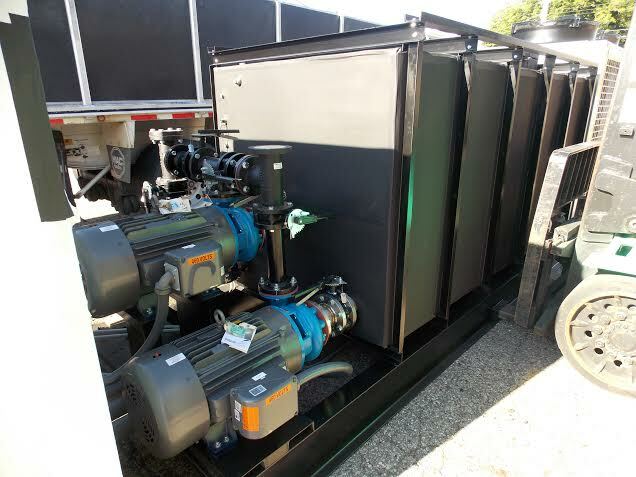 Fluid Chillers specializes in controlling straight water to close to freezing temperatures for processing. This project provides a customer with 4000 gallons of water just above freeze point, on demand. 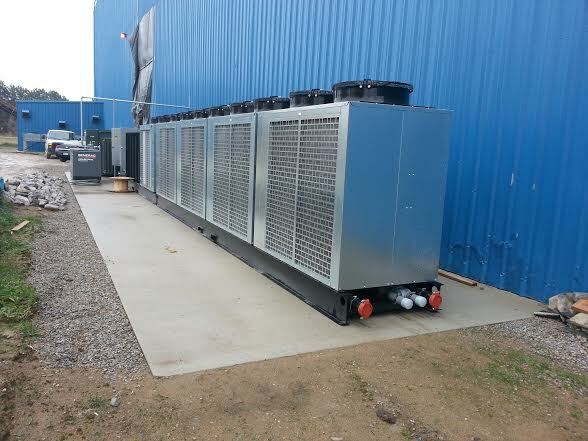 Chiller and tank system are skid mounted for outdoor installation. 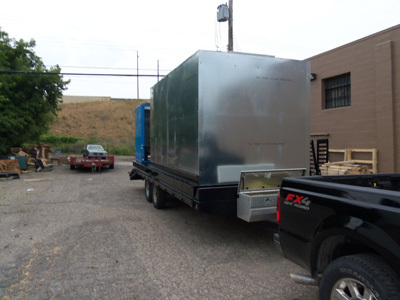 Fluid Chillers builds one of its largest module units ever, for Michigan State University’s new Cyclotron Project. Fluid Chillers, Lansing, Michigan, U.S.A. 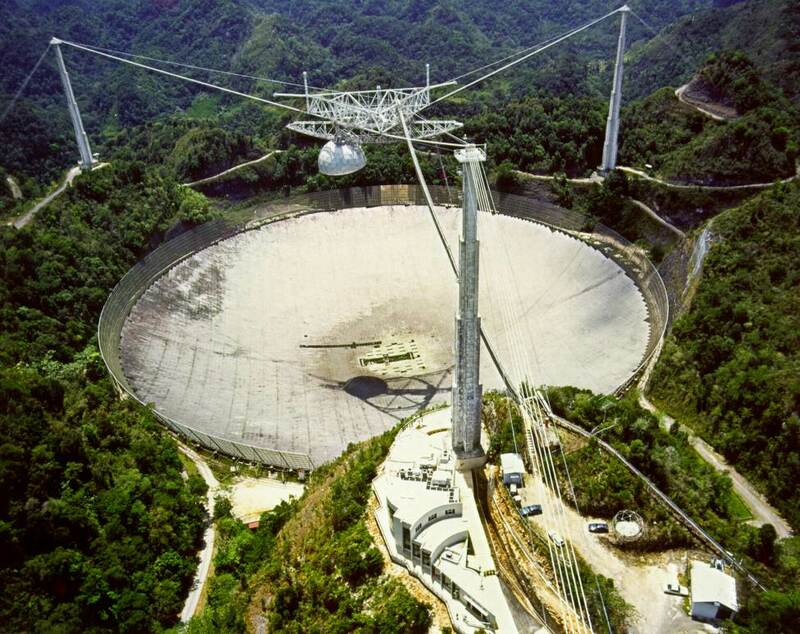 Recently completed the cooling system for the worlds largest telescope located in South America. Fluid Chillers recently received the highest Mechanical Contractor award for providing four of the largest drinking water chiller systems operating in the Middle East in ambient temperature up to 130ºf. 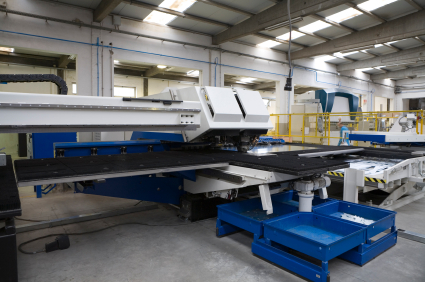 Fluid Chillers adds capacity in their sheet metal and fabrication area to meet the expanding needs of their customers faster. 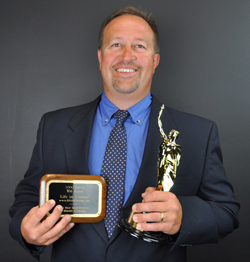 Michigan's Fastest Growing Tech Manufacturing Co.